Here, we present a simple method to quantitate hematopoietic stem and progenitor cells (HSPCs) in embryonic zebrafish. HSPCs from dissociated zebrafish are plated in methylcellulose with supportive factors, differentiating into mature blood. This allows the detection of blood defects and allows drug screening to be easily conducted. Berrun, A. C., Stachura, D. L. Development of an In Vitro Assay to Quantitate Hematopoietic Stem and Progenitor Cells (HSPCs) in Developing Zebrafish Embryos. J. Vis. Exp. (129), e56836, doi:10.3791/56836 (2017). Hematopoiesis is an essential cellular process in which hematopoietic stem and progenitor cells (HSPCs) differentiate into the multitude of different cell lineages that comprise mature blood. Isolation and identification of these HSPCs is difficult because they are defined ex post facto; they can only be defined after their differentiation into specific cell lineages. Over the past few decades, the zebrafish (Danio rerio) has become a model organism to study hematopoiesis. Zebrafish embryos develop ex utero, and by 48 h post-fertilization (hpf) have generated definitive HSPCs. Assays to assess HSPC differentiation and proliferation capabilities have been developed, utilizing transplantation and subsequent reconstitution of the hematopoietic system in addition to visualizing specialized transgenic lines with confocal microscopy. However, these assays are cost prohibitive, technically difficult, and time consuming for many laboratories. Development of an in vitro model to assess HSPCs would be cost effective, quicker, and present fewer difficulties compared to previously described methods, allowing laboratories to quickly assess mutagenesis and drug screens that affect HSPC biology. This novel in vitro assay to assess HSPCs is performed by plating dissociated whole zebrafish embryos and adding exogenous factors that promote only HSPC differentiation and proliferation. Embryos are dissociated into single cells and plated with HSPC-supportive colony stimulating factors that cause them to generate colony forming units (CFUs) that arise from a single progenitor cell. These assays should allow more careful examination of the molecular pathways responsible for HSPC proliferation, differentiation, and regulation, which will allow researchers to understand the underpinnings of vertebrate hematopoiesis and its dysregulation during disease. Hematopoiesis is the process of making the multitude of mature blood cells required for an organism's survival. It is a key developmental process that involves the differentiation of hematopoietic stem cells (HSCs) into a variety of developmentally restricted cell types that comprise mature blood. These HSCs must self-renew so that the system is never exhausted and they must persist from early embryonic development until death. In vertebrates, constant differentiation and proliferation of hematopoietic stem and progenitor cells (HSPCs) are needed to adequately replenish the majority of blood cells that are post-mitotic and being recycled every day. HSCs generate mature blood cells by first differentiating into subsets of restricted progenitor cells; common lymphoid progenitors (CLPs)1, which eventually produce T, B, and NK cells, and common myeloid progenitors (CMPs)2 that generate granulocytes, erythrocytes, macrophages, and megakaryocytes. These progenitors are committed to generating specific cell lineages, and further differentiate into more developmentally restricted progenitor cells such as myeloid erythroid progenitors (MEPs) that generate erythrocytes and platelets, or granulocyte macrophage progenitors (GMPs) that generate basophils, eosinophils, neutrophils, and macrophages2. Identifying and isolating these progenitors allows the identification of important molecular pathways involved in hematopoietic differentiation and many hematopoietic diseases such as leukemia arise when these progenitor cells fail to properly differentiate. Over the past few decades, the zebrafish (Danio rerio) model system has become a key research tool for embryonic and adult hematopoietic studies. Zebrafish are amenable to genetic analysis and are the phylogenetically lowest vertebrate model species that have a similar vasculature and hematopoietic system to humans. Zebrafish embryos develop ex utero, and within 48 hours post fertilization (hpf) generate HSPCs3,4,5,6,7,8. Zebrafish are also highly fecund, with females laying over 100 eggs in a single clutch, allowing for large sample sizes and experimental replication. Zebrafish embryos are optically transparent, allowing for microscopic visualization of the hematopoietic system. Several fluorescent transgenic lines of zebrafish marking HSCs such as runx1:EGFP fish9, cd41:EGFP fish10, and kdrl:mCherry; cmyb:GFP3 double-positive animals, allow for live, real-time visualization of HSC emergence and expansion in vivo3,4,7,8,9. The zebrafish's quick generation time and development ex utero has led to its use in mutagenesis studies11,12,13,14,15 and drug screening16,17,18,19,20 for compounds that hold therapeutic promise for human blood disorders. Overall, conservation of the hematopoietic system, the presence and easy development of transgenic lines, and quick regeneration time has made the zebrafish an inexpensive, quick, flexible, and ideal model for hematopoietic studies. Numerous methods of isolating and testing HSCs have been developed in mammalian hematopoietic systems. Investigators can utilize a combination of cell surface receptors to mark HSCs21,22,23,24, as well as exploit the ability of HSCs to efflux dye25,26. After they are labeled, fluorescence-activated cell sorting (FACS) allows their physical separation. Proving that a cell is an HSC requires irradiating a host animal to destroy endogenous HSPCs, transplanting putative HSCs, and observing long-term, multi-lineage reconstitution of all mature blood cell types. These assays work well in mice, as there are numerous cell-surface antibodies against hematopoietic cells and inbred mouse strains that facilitate immune matching for transplantation. However, few zebrafish hematopoietic cell-surface antibodies have been generated27, hindering the identification and isolation of HSCs. The most common way to mark and isolate zebrafish HSCs is with transgenic animals, whereby a cell-specific promoter sequence is driving a fluorescent protein's expression. Studies have visualized and enumerated HSCs in the ventral wall of the dorsal aorta with microscopy utilizing this technique3,4,8,9. Other laboratories have generated clonal strains of zebrafish28,29 and have performed successful transplants in MHC-matched animals30. However, these techniques are cost prohibitive to many laboratories, are technically difficult, and are time consuming. To address these issues, laboratories have generated several in vitro assays to test for the presence, the proliferation rates, and the differentiation capacity of HSPCs31,32,33,34,35,36. These assays show proliferation and differentiation of HSPCs in vitro31,32,33,34,35,36, the rescue of hematopoietic defects36, and an efficient method for discovering and testing cytokines33,34,35. They have also been utilized to identify genes responsible for HSPC biology31,32. In this study, we take these assays a step further, allowing the quantitation of HSPCs in a developing zebrafish embryo. These assays can also be utilized to quantitate the number of HSPCs in mutant animals and animals treated with hematopoietic-disruptive drugs. In essence, these assays are fast, present few technical challenges, and are inexpensive ways to quantitate HSPC numbers, examine their proliferation, and investigate blocks in differentiation. The Institutional Animal Care and Use Committee (IACUC) advisory board at California State University, Chico, approved all methods described below. With 15 cm (w) x 15 cm (l) x 7 cm (h) plastic containers create 3 wash stations: 1) with 1 mL of 5% bleach in 1000 mL embryo medium (E3; see Table 1), 2) with sterile E3, and 3) with sterile E3. Ensure that each container has 500 mL of solution to submerge the embryos in. NOTE: For each condition tested, at least 10 embryos will be needed. This washing procedure can accommodate up to 200 embryos. With a transfer pipette, place embryos into a tea strainer and submerge eggs in wash station #1 for 5 min. Remove the tea strainer (with embryos inside) and place into wash station #2 for 5 min; repeat for wash station #3 for a final 5 min. After the last wash, rinse embryos from tea strainer by turning it upside down over a clean 10 cm Petri dish and gently rinsing embryos off the tea strainer with sterile E3 and a transfer pipette. With a transfer pipette, remove and discard as much E3 as possible from the Petri dish and add 500 μL of dechorionation protease (10 mg/mL) to embryos. Incubate at room temperature for 5 min. Gently tap the side of the Petri dish to completely remove chorions. With a serological pipette, add 20 mL of sterile E3 to dilute protease. Allow embryos to settle, and remove the E3 with a transfer pipette. Repeat this wash step 3 times to remove all traces of the dechorionation protease. Using a P1000 pipette, place 10 embryos into a single sterile 1.5 mL microcentrifuge tube. Remove E3 with a pipette and discard. Caution: Pipette with care as embryos can easily be displaced and discarded during the following wash steps. Transfer samples to laminar flow hood, and wash embryos by adding 1 mL sterile E3. Allow embryos to settle to bottom of tube and remove supernatant with a P1000 pipette. Repeat for a total of 3 washes. After last wash, remove E3 and discard. Add 1 mL of 10 mM dithiothreitol (DTT) in E3 to remove the mucus coating (and any spores, yeast, or bacteria that may be trapped in it) surrounding the embryonic zebrafish. Lay microcentrifuge tube horizontally, and incubate at room temperature in laminar flow hood for 25 min. Wash sample 3 times with 1 mL of sterile DPBS (with Ca2+ and Mg2+). After last wash add 500 μL of DPBS (with Ca2+ and Mg2+) and add 5 μL of 5 mg/mL (26 U/mL) dissociation protease. Caution: This enzyme needs Ca2+ and Mg2+, so ensure that the DPBS contains these ions. Incubate samples at 37 °C on a horizontal orbital shaker at 180 rpm for 60 min. Place samples in the laminar flow hood and triturate embryos with a P1000 until samples are fully dissociated. Caution: Check embryos periodically to determine when they become dissociated. The embryo solution should have some amount of tissue present; it should not be completely homogenous. It is possible to over-digest, which will destroy the HSPCs (see Supplemental Figure 1). Pipette the 10 dissociated embryos onto the top reservoir of a 5 mL polystyrene round bottom tube with a 35 μm cell strainer cap. With a pipette, rinse the Petri tube with sterile PBS (with no Ca2+ or Mg2+) and transfer solution to 5 mL polystyrene tube containing filtered cells from step 6.1. Repeat until 4 mL of liquid is present in the 5 mL polystyrene tube. Centrifuge tubes at 4 °C and 300 x g for 5 min to pellet the homogenized cell sample. With a pipette, remove and discard supernatant from the round bottom tube. Take care to not disrupt the cells pelleted at the bottom of the tube. Resuspend the cells in 100 μL of PBS. Generate 1x complete methylcellulose (Table 1) stock solution and add 2.5 mL to sterile round-bottom 14 mL tubes with 3 mL syringes and 16 G needles. Use one tube for each condition tested. Add cytokines, small molecules, or other agents to be investigated to each sample. For myeloid differentiation, add 1% Carp serum and 0.3 mg/mL recombinant zebrafish granulocyte colony stimulating factor (Gcsf)34 to methylcellulose medium. See Svoboda et al.37 for full description on how to generate carp serum and recombinant cytokines. For erythroid differentiation, add 1% Carp serum and 0.1 mg/mL recombinant zebrafish erythropoietin (Epo)38 to methylcellulose medium. To examine multilineage progenitors, add Epo and Gcsf. Caution: Cytokines and additives should not total more than 10% of the total volume, as the medium will not be viscous enough to discern individual colonies. Using a pipette, add 100 μL of the dissociated 10 embryos to the surface of the prepared methylcellulose with recombinant cytokines and carp serum. Cap lid and vortex gently to fully homogenize sample. Each tube should now contain the dissociated tissue of 10 embryos. Using 3 mL syringes and 16 G needles, aliquot 1 mL of sample into 2 separate 35 mm Petri dishes. Make sure that the sample is fully dispersed throughout the Petri dish. Repeat for each sample. Place 35 mm Petri dishes with cells in methylcellulose into a 15 cm Petri dish. To each 15 cm dish, add one 35 mm Petri plate with 5 mL of sterile water to humidify the samples. Incubate at 32 °C and 5% CO2 for 7 - 10 days. After incubating 7 days, place samples onto an inverted microscope at 40 - 100X for visualization and enumeration. At this point, individual colonies can be isolated with a pipette and subjected to staining and/or gene analysis. To assess HSPC numbers in embryonic zebrafish, 48 hpf embryos were digested, plated in methylcellulose with exogenous hematopoietic-supportive growth factors, and incubated for 7 days (Figure 1A). After 7 days, colony forming units (CFUs) were enumerated (Figure 1B) and imaged (Figure 1C). By controlling the different cytokines added, one can control the types of colonies produced: Epo is necessary for erythroid differentiation and Gcsf is necessary for myeloid differentiation. Carp serum is analogous to fetal bovine serum's use in mammalian tissue culture; it is a source of general growth factors. In Figure 1, Epo, Gcsf, and carp serum were added, allowing the enumeration of erythroid, myeloid, and mixed erythromyeloid colonies. These colonies can be discerned due to their shape and color; the erythroid colonies are tight, small, compact, and have a red color due to hemoglobinization. The myeloid colonies are larger and have more motile cells on their edges, giving them a ruffled appearance. Successful plating of embryonic zebrafish treated with HSPC-supportive factors will yield CFUs after 7 - 10 days of incubation. Importantly, the quantity of CFUs directly correlates with the number of embryos plated (Figure 1B). Plating either 4 or 8 embryos per mL (which correlates to starting with 10 or 20 embryos at the beginning of the experiment) yields approximately 1,200 or 2,400 CFUs, respectively. Our protocol suggests using 10 embryos, as it is difficult and time consuming to count 2,400 CFUs when performing a larger experiment. Due to the methodology of digesting whole embryos, miscellaneous debris is present in the methylcellulose, but can easily be discerned from actual colonies with higher magnification under the microscope. Other cellular debris may also be present, but the only CFUs present will be HSPC-derived due to the addition of HSPC-supportive cytokines. If CFUs are small and not easily seen, the cultures can be incubated up to 10 days to encourage increased growth. However, increased incubation will not yield more CFUs; if CFUs are not present, this indicates a loss of cytokine activity, over digestion of embryos (and subsequent destruction of HSPCs; see Supplemental Figure 1), or improper plating of samples. It is always important to run proper controls every time this experiment is performed to ensure that slight variations in technique do not yield false differences in HSPC enumeration. For example, if an experiment is performed to analyze the number of HSPCs present in morphant embryos, a sample with normal siblings should be prepared alongside. If an experiment is performed to compare the effect of a drug on the development of HSPCs a sample with untreated siblings should be prepared and analyzed alongside. Figure 1: Enumerating HSPC-derived CFUs from 48 hpf zebrafish embryos. 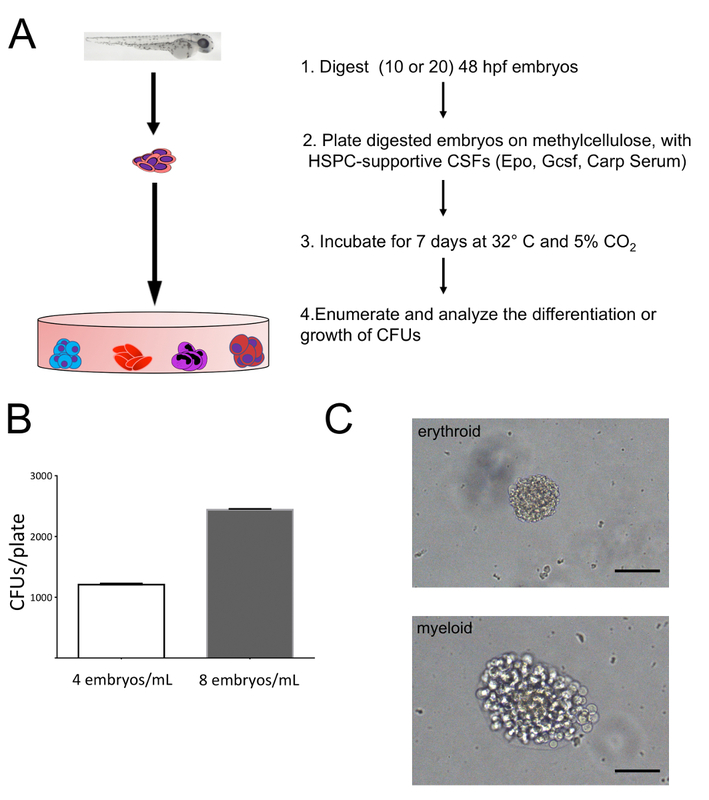 (A) Schematic overview of embryo plating on methylcellulose with HSPC-supportive cytokines for generation of hematopoietic CFUs. 48 hpf zebrafish embryos were dissociated and plated on 1% complete methylcellulose with erythropoietin (Epo), granulocyte colony stimulating factor (Gcsf), and carp serum, allowing erythromyeloid differentiation. (B) Enumeration of colony forming units (CFUs) from samples plated at concentrations of 4 or 8 embryos per mL (starting the experiment with 10 or 20 embryos, respectively). Enumeration was done at 100X on an inverted microscope. Bars indicate average numbers of CFUs, and error bars indicate standard deviation. (C) Colony morphology representative of embryo plating on methylcellulose. The colony's morphology indicates the types of cells that comprise the colony; images are representative erythroid and myeloid colonies. CFUs photographed at 400X. Scale bars = 50 μm. Please click here to view a larger version of this figure. Supplemental Figure 1: Digestion of embryos with dissociation protease. 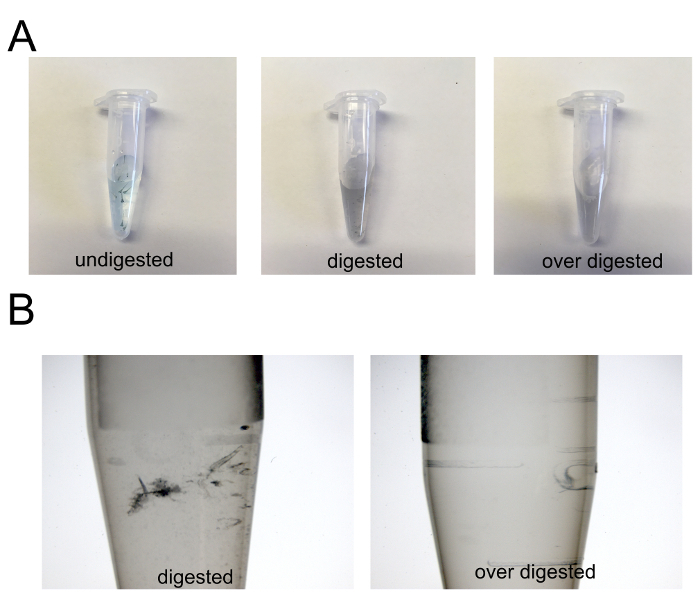 (A) Images of 10 embryos before digestion (left; undigested), after adequate digestion (middle; digested), and after excess digestion (right; over digested). (B) Zoomed in images (7.3X) of digested and over digested tubes in (A). Please click here to view a larger version of this figure. The zebrafish model system has become an efficient, effective, and inexpensive model for studying primitive and definitive vertebrate hematopoiesis. Generation of assays that are fast, inexpensive, and present few technical difficulties can be utilized for testing small molecules, analyzing mutant embryos, and elucidating molecular pathways important for HSPC biology. In vitro plating of HSPCs from adult zebrafish is an effective method to study mutagenesis, cytokines, and hematopoietic defects. This protocol builds upon those studies, but utilizes embryonic zebrafish. Applying these assays to embryonic zebrafish allows for quicker data collection, the use of less physical space, the use of less drugs (for drug screens), and permits testing mRNA overexpression and/or morpholino (MO) knockdown of specific genetic pathways. Importantly, it also allows the study of stages of hematopoiesis that only occur during early vertebrate development. Due to the flexibility of this assay, it can easily be modified to meet many diverse needs. One modification of this protocol is the modulation of developmental timing; modifying the age of embryos utilized allows the quantitation of HSPC generation over time. This can also allow the study of distinct subsets of HSPCs such as erythromyeloid progenitors6, which arise before 36 hpf, versus bona fide HSCs3,4,5,8, which arise afterwards. No one has yet been able to isolate and identify more restricted zebrafish HSPC subsets in the developing embryo, but these assays allow these experiments. It is essential that when changing the developmental stages of the animals, the amount of cells added into the methylcellulose is also optimized; too few animals will yield no colonies, while too many will create an uncountable plate of HSPC colonies. Adding different cytokines is another modification that can be adapted to specific experiments. Adding Epo will allow the quantitation of erythroid colonies, while Gcsf will allow enumeration of myeloid colonies. Adding both of these cytokines will allow multi-lineage CFU generation. Importantly, these assays permit testing of putative cytokines and their effect on HSPC proliferation and differentiation. These assays can also be modified to perform large scale drug testing; embryos can be exposed to different concentrations of compounds at different time points during development to see if the chemicals have a positive or negative effect on blood production. A final way that these experiments can be modified is that embryos can be injected at the one-cell stage with specific mRNA or MOs, which will overexpress or knockdown specific genes, respectively. After developing for 24 - 48 h, these embryos can be subjected to these assays to determine if gain- or loss-of-function of specific genes play an essential role in HSPC formation, proliferation, and differentiation. It is also important to note that utilizing different transgenic strains of zebrafish will aid in the speed and ease of collecting and interpreting data. For instance, if one is interested in erythroid development, it is easy to perform these experiments in gata1:DsRed embryos40, which have the promoter of the erythroid-specific transgenic Gata1 transcription factor driving DsRed fluorescence. In this way, when analyzing erythroid colonies, fluorescence microscopy can be utilized. Likewise, these studies can be performed on animals with multiple transgenes present to look for multiple cell lineages at once. This technique would be useful for identifying multilineage HSPCs; although erythroid and myeloid colonies are easily distinguishable by morphology, it is difficult to identify colonies that contain bipotential progenitors without visualizing the presence of multiple lineage-specific transgene expression in the same colony. Although these assays have many benefits, it is essential to set up adequate controls every time these experiments are performed; minor variations in technique could change the results and interpretations of the findings. For example, it is possible to get different numbers of HSPCs when you perform the experiments on different days if your technique is not precise; to deal with this possibility, one should always include an appropriate control. If an experiment is performed to test the effect of a MO on development, then control embryos (either uninjected or injected with a control MO) that are from the same clutch should also be processed alongside the experimental sample. If the experiment is designed to test the effect of a particular drug, then untreated samples should be included as a control. Finally, if testing the effects of a specific cytokine on development, then animals from the same clutch should also be processed and examined at the same time without having the cytokine added to the culture. While this in vitro assay is straightforward to perform and the results are easy to interpret, some potential problems can arise during the procedure. If no colonies are seen after 7 days in culture, there are several issues that may have occurred. First, check to make sure that the cytokines are pure and at proper concentrations; depending on how the cytokines have been produced it may be necessary to alter concentrations and optimize their activity. Another issue that commonly arises is over-digesting the embryos, which destroys the HSPCs; take care at the digestion step, and alter the timing if no colonies are repeatedly seen. Finally, the mixing of methylcellulose and addition of carp serum could be the issue, so make sure that all ingredients were added and mixed correctly. In addition to technical issues, it is important to realize that colonies may need longer to develop under certain circumstances; often small colonies are much more visible after an additional 3 days in culture. Going past 10 days is not recommended, as the methylcellulose starts to dry out shortly thereafter. Another common issue is that sometimes colonies tend to collect around the edges of the 35 mm Petri dishes; scanning the plates thoroughly, especially around the edges, is essential. Also, it is important to remember that these colonies are developing in a thick, viscous material; when focusing the microscope, adjust the focus up and down to observe slightly different planes- the colonies will not be sitting on the bottom of the plastic dishes. These in vitro assays have plenty of advantages, but they also have a few limitations. The largest issue is that these assays cannot prove definitively that a progenitor is an HSC- that can only be proven by long-term reconstitution of irradiated animals. Additionally, not all cytokines have been defined and investigated in zebrafish yet, which limits the types of HSPCs that can be investigated. For instance, no zebrafish lymphoid-supportive cytokines have been identified yet, preventing B and T cell production in these assays. Furthermore, it is unclear when culturing multipotent HSPCs if the addition of certain types (or amounts) of specific cytokines can skew the differentiation down certain hematopoietic pathways. Another potential caveat is that this assay cannot effectively discern if HSPCs are actually present in a sample, but for some reason are unable to differentiate (or are otherwise not viable). As with most in vitro assays, further experiments should always be performed to validate the findings. Barring these issues, much information can be gleaned from these clonal assays. These assays are significant, because they allow quick and efficient screening of hematopoietic defects. Researchers can knock down certain genetic pathways with MOs, and plate digested animals to see if the gene plays a role in hematopoiesis. Additionally, mutant fish (previously generated or newly generated in mutagenesis screens) can be assessed quickly and easily. These assays also allow efficient drug screening assays on live, whole organisms to identify the modulation of HSPC biology while also being able to observe if the drugs have a negative effect on development or survival. These assays also allow quantitation of HSPCs in the developing zebrafish at different timepoints. While multiple studies have attempted to quantitate HSC numbers in adult7,27,30,41 and embryonic zebrafish3,4,42,43, no studies have quantitated the different amounts of lineage-restricted HSPCs in zebrafish. Additionally, these assays can be utilized to examine and modulate molecular pathways important in blood cell formation and differentiation, a process that remains enigmatic. Funding was provided by the National Institutes of Health (NIH: K01-DK087814-01A1 to D.L.S. ), the California State University Program for Education & Research in Biotechnology (CSUPERB: Molecular Control of the Vertebrate Hematopoietic Niche to D.L.S.) and from the Graduate Studies Office at California State University Chico (to A.C.B.). Kondo, M., Weissman, I. L., Akashi, K. Identification of clonogenic common lymphoid progenitors in mouse bone marrow. Cell. 91, 661-672 (1997). Akashi, K., Traver, D., Miyamoto, T., Weissman, I. L. A clonogenic common myeloid progenitor that gives rise to all myeloid lineages. Nature. 404, 193-197 (2000). Bertrand, J. Y., et al. Haematopoietic stem cells derive directly from aortic endothelium during development. Nature. 464, 108-111 (2010). Kissa, K., Herbomel, P. Blood stem cells emerge from aortic endothelium by a novel type of cell transition. Nature. 464, 112-115 (2010). Bertrand, J. Y., Kim, A. D., Teng, S., Traver, D. CD41+ cmyb+ precursors colonize the zebrafish pronephros by a novel migration route to initiate adult hematopoiesis. Development. 135, 1853-1862 (2008). Bertrand, J. Y., et al. Definitive hematopoiesis initiates through a committed erythromyeloid progenitor in the zebrafish embryo. Development. 134, 4147-4156 (2007). Ma, D., Zhang, J., Lin, H. F., Italiano, J., Handin, R. I. The identification and characterization of zebrafish hematopoietic stem cells. Blood. 118, 289-297 (2011). Lam, E. Y., Hall, C. J., Crosier, P. S., Crosier, K. E., Flores, M. V. Live imaging of Runx1 expression in the dorsal aorta tracks the emergence of blood progenitors from endothelial cells. Blood. 116, 909-914 (2010). Lam, E. Y., et al. Zebrafish runx1 promoter-EGFP transgenics mark discrete sites of definitive blood progenitors. Blood. 113, 1241-1249 (2009). Lin, H. F., et al. Analysis of thrombocyte development in CD41-GFP transgenic zebrafish. Blood. 106, 3803-3810 (2005). Driever, W., et al. A genetic screen for mutations affecting embryogenesis in zebrafish. Development. 123, 37-46 (1996). Weinstein, B. M., et al. Hematopoietic mutations in the zebrafish. Development. 123, 303-309 (1996). Ransom, D. G., et al. Characterization of zebrafish mutants with defects in embryonic hematopoiesis. Development. 123, 311-319 (1996). Amsterdam, A., et al. A large-scale insertional mutagenesis screen in zebrafish. Genes Dev. 13, 2713-2724 (1999). Gaiano, N., et al. Insertional mutagenesis and rapid cloning of essential genes in zebrafish. Nature. 383, 829-832 (1996). Yeh, J. R., et al. Discovering chemical modifiers of oncogene-regulated hematopoietic differentiation. Nat Chem Biol. 5, 236-243 (2009). Paik, E. J., de Jong, J. L., Pugach, E., Opara, P., Zon, L. I. A chemical genetic screen in zebrafish for pathways interacting with cdx4 in primitive hematopoiesis. Zebrafish. 7, 61-68 (2010). Ridges, S., et al. Zebrafish screen identifies novel compound with selective toxicity against leukemia. Blood. 119, 5621-5631 (2012). North, T. E., et al. Prostaglandin E2 regulates vertebrate haematopoietic stem cell homeostasis. Nature. 447, 1007-1011 (2007). Astuti, Y., et al. A Functional Bioluminescent Zebrafish Screen for Enhancing Hematopoietic Cell Homing. Stem Cell Reports. 8, 177-190 (2017). Kiel, M. J., et al. SLAM family receptors distinguish hematopoietic stem and progenitor cells and reveal endothelial niches for stem cells. Cell. 121, 1109-1121 (2005). Spangrude, G. J., Heimfeld, S., Weissman, I. L. Purification and characterization of mouse hematopoietic stem cells. Science. 241, 58-62 (1988). Morrison, S. J., Weissman, I. L. The long-term repopulating subset of hematopoietic stem cells is deterministic and isolatable by phenotype. Immunity. 1, 661-673 (1994). Osawa, M., Hanada, K., Hamada, H., Nakauchi, H. Long-term lymphohematopoietic reconstitution by a single CD34-low/negative hematopoietic stem cell. Science. 273, 242-245 (1996). Goodell, M. A., et al. Dye efflux studies suggest that hematopoietic stem cells expressing low or undetectable levels of CD34 antigen exist in multiple species. Nat Med. 3, 1337-1345 (1997). Goodell, M. A., Brose, K., Paradis, G., Conner, A. S., Mulligan, R. C. Isolation and functional properties of murine hematopoietic stem cells that are replicating in vivo. J Exp Med. 183, 1797-1806 (1996). Gansner, J. M., et al. Sorting zebrafish thrombocyte lineage cells with a Cd41 monoclonal antibody enriches hematopoietic stem cell activity. Blood. 129, 1394-1397 (2017). Smith, A. C., et al. High-throughput cell transplantation establishes that tumor-initiating cells are abundant in zebrafish T-cell acute lymphoblastic leukemia. Blood. 115, 3296-3303 (2010). Mizgirev, I., Revskoy, S. Generation of clonal zebrafish lines and transplantable hepatic tumors. Nat Protoc. 5, 383-394 (2010). de Jong, J. L., et al. Characterization of immune-matched hematopoietic transplantation in zebrafish. Blood. 117, 4234-4242 (2011). Wolf, A., et al. Zebrafish Caudal Haematopoietic Embryonic Stromal Tissue (CHEST) Cells Support Haematopoiesis. Sci Rep. 7, 44644 (2017). Campbell, C., et al. Zebrafish embryonic stromal trunk (ZEST) cells support hematopoietic stem and progenitor cell (HSPC) proliferation, survival, and differentiation. Exp Hematol. 43, 1047-1061 (2015). Svoboda, O., et al. Dissection of vertebrate hematopoiesis using zebrafish thrombopoietin. Blood. 124, 220-228 (2014). Stachura, D. L., et al. The zebrafish granulocyte colony-stimulating factors (Gcsfs): 2 paralogous cytokines and their roles in hematopoietic development and maintenance. Blood. 122, 3918-3928 (2013). Stachura, D. L., et al. Clonal analysis of hematopoietic progenitor cells in the zebrafish. Blood. 118, 1274-1282 (2011). Stachura, D. L., et al. Zebrafish kidney stromal cell lines support multilineage hematopoiesis. Blood. 114, 279-289 (2009). Svoboda, O., et al. Ex vivo tools for the clonal analysis of zebrafish hematopoiesis. Nat Protoc. 11, 1007-1020 (2016). Paffett-Lugassy, N., et al. Functional conservation of erythropoietin signaling in zebrafish. Blood. 110, 2718-2726 (2007). Stachura, D. L., Traver, D. Cellular dissection of zebrafish hematopoiesis. Methods Cell Biol. 133, 11-53 (2016). Traver, D., et al. Transplantation and in vivo imaging of multilineage engraftment in zebrafish bloodless mutants. Nat Immunol. 4, 1238-1246 (2003). Kobayashi, I., et al. Characterization and localization of side population (SP) cells in zebrafish kidney hematopoietic tissue. Blood. 111, 1131-1137 (2008). Henninger, J., et al. Clonal fate mapping quantifies the number of haematopoietic stem cells that arise during development. Nat Cell Biol. 19, 17-27 (2017). Tamplin, O. J., et al. Hematopoietic stem cell arrival triggers dynamic remodeling of the perivascular niche. Cell. 160, 241-252 (2015).